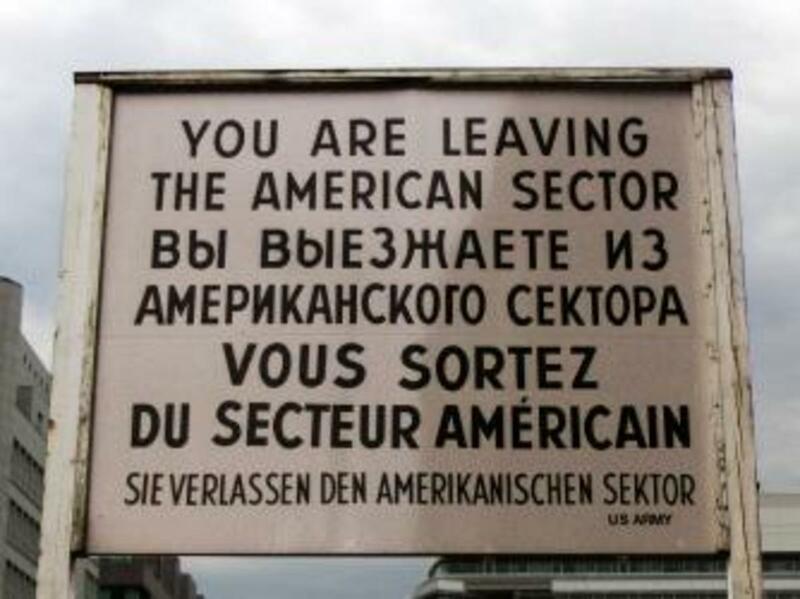 Get eight facts about the Berlin border crossing that served as an iconic symbol of the Cold War. 1. Only foreigners were allowed to cross through it. 2. It sat just a few feet away from a much larger East German checkpoint. Replica of the famous sign that once stood near the Checkpoint. Despite remaining in operation for nearly three decades, the Allied side of Checkpoint Charlie consisted of only a tiny prefabricated shack and a few sandbags. The original wooden guardhouse was replaced by a larger metal building in the 1980s, but the Allies always kept their operation simple as a way of symbolizing their view that the Berlin Wall was not a permanent or legitimate border. This stood in contrast to the more elaborate East German side of the checkpoint, which boasted guard towers, cement barriers and a shed where departing vehicles underwent searches and heat scans to ensure they weren’t hiding fugitives. Non-military travelers were often subject to intense scrutiny before being allowed to pass the East German border, and guards were known to confiscate any newspapers or literature that contradicted communist ideology. 3. It was the site of several daring escapes by East Germans. Since Checkpoint Charlie was one of the few gaps in the maze of barriers, barbed wire and guard towers that made up the Berlin Wall, it attracted many desperate East Germans looking to flee to the West. In April 1962, an Austrian named Heinz Meixner snuck his East German girlfriend and her mother across the border by lowering the windshield on a rented Austin-Healey convertible and speeding underneath the checkpoint’s vehicle barrier. Another man later repeated the stunt before the East Germans added steel bars to the crossing. In another famous getaway, photographer Horst Beyer set up a photo shoot at Checkpoint Charlie and then hopped across the border while pretending to snap pictures. 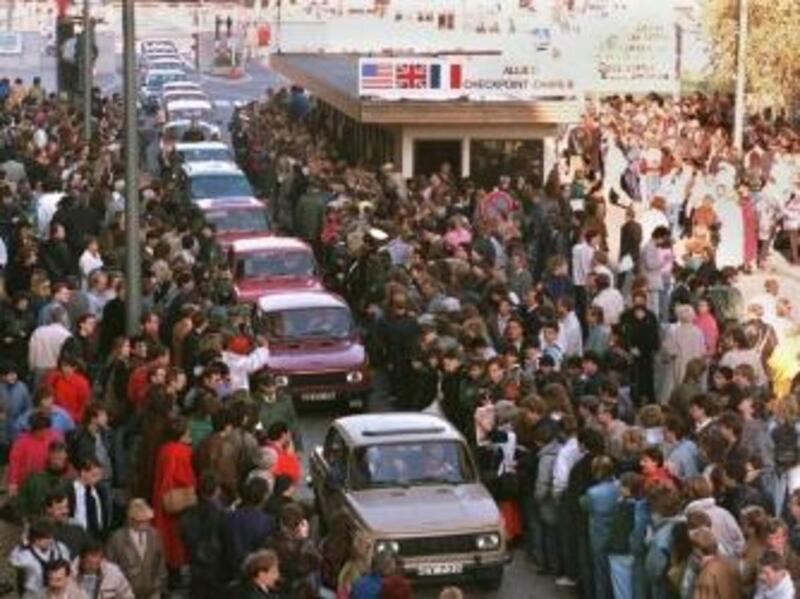 U.S. military personnel were officially forbidden to give aid to escapees, but shortly before the Berlin Wall fell in 1989, an American serviceman named Eric Yaw successfully smuggled an East German father and daughter through Checkpoint Charlie in the trunk of his car. 4. It was the scene of an infamous showdown between the United States and the Soviet Union. One of the most nail-biting chapters of the Cold War began on October 22, 1961, when U.S. diplomat Allan Lightner attempted to cross Checkpoint Charlie to attend the opera in East Berlin. East German border guards demanded to see Lightner’s passport, but he refused on the grounds that only Soviet officials had the authority to inspect his papers. He only got through the checkpoint after he left and returned with a complement of armed U.S. soldiers and military jeeps. 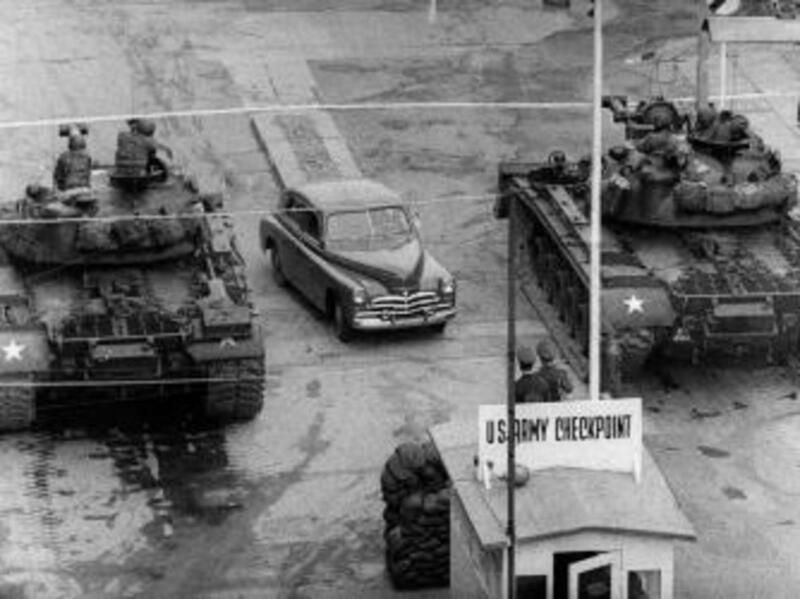 When East German officials continued to deny Americans entry into East Berlin, U.S. General Lucius Clay put on a show of force by moving 10 M-48 tanks into position around Checkpoint Charlie. The East Germans’ Soviet allies responded by positioning three-dozen T-55 tanks near the eastern border. 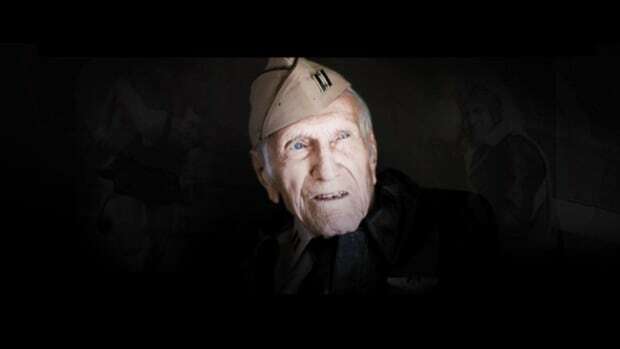 On October 27, 10 of them rode forward to meet the American armor. 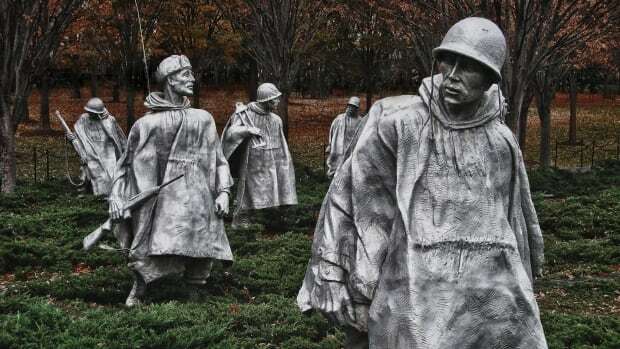 For some 16 hours, the two sides stared each other down in one of the only armed confrontations of the Cold War. 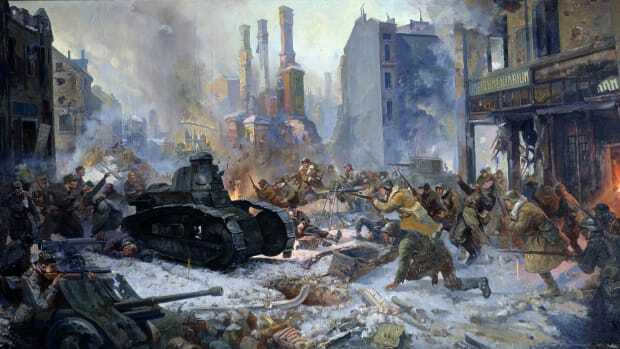 The potential for World War III was only averted when President John F. Kennedy contacted Soviet leader Nikita Khrushchev and convinced him to withdraw his tanks. A few minutes later, the American M-48s also left the scene. 5. It was occasionally used for prisoner swaps. 6. East Germans flooded through its gates during the fall of the Berlin Wall. 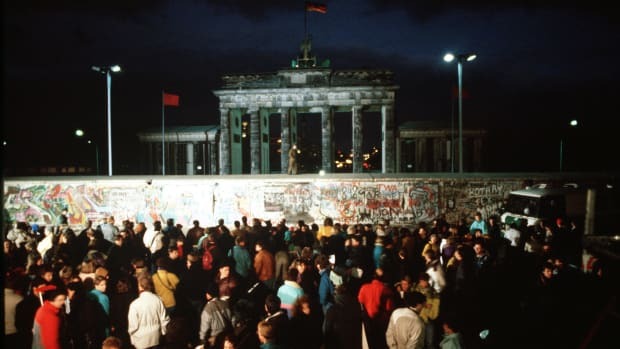 In response to mass protests and international criticism, the East German government finally eased its travel restrictions on November 9, 1989. The new policy was supposed to take effect in an orderly fashion, but it turned into a free-for-all after a government official misspoke during a press conference and said the law was changing right away. That night, impromptu street parties broke out around Berlin. Thousands of East Germans gathered outside Checkpoint Charlie and other crossing points and began screaming for the guards open the gates. Westerners stood on the other side and yelled for their countrymen to come over and join them. After a four-hour standoff, Checkpoint Charlie’s bewildered border guards finally opened the barriers, allowing people to move freely between East and West Berlin for the first time in nearly 30 years. 7. The iconic guardhouse is now kept in a museum. While the events of November 9, 1989, signaled the end of a divided Berlin, Checkpoint Charlie remained in operation until seven months later, when its famous beige guardhouse was removed during a ceremony attended by French, British, American, German and Soviet dignitaries. “For 29 years, Checkpoint Charlie embodied the cold war,” U.S. Secretary of State James Baker said during the proceedings. “We meet here today to dismantle it and to bury the conflict that created it.” A replica version of the guardhouse was later installed on Friedrichstrasse as a tourist attraction, but the original now sits on display at the Allied Museum in Berlin.